The Legend of Zelda opens with Link in the small clearing of a lush Hyrule forest. At that point, the entire world is a single plot of land that exactly fits the dimensions of modern 1987 television screens. Take a moment to survey your surroundings and you’ll notice four options; you can travel north, go west, or head east, but you enter the cave first. There you get the most classic of all weapons to aid you, a trusty sword. You’re going to need it as the fate of a Princess and her Kingdom rests in your ability to reassemble the eight scattered pieces of the mythical Triforce of Wisdom and defeat the sinister Ganon. The epic adventures of literature were about the personal growth of its hero, a test of human character against overwhelming odds that stir the audience’s heart and excite its mind. They instill the idea that anyone can be the hero, that it’s a small set of characteristics that matter: courage and willpower. By the end, witnessing the character’s struggles to overcome great adversity inspires the viewer to stand and fight for their own goals, no matter the challenge that lies before them. But videogames aren’t literature. By building a virtual machine capable of simulating an experience, videogames implement mechanisms that not only create story rather than tell it, but puts the onus of the adventure on the player, requiring them to overcome obstacles and explore the world, their hand gripping the controller like it was Excalibur. The key to the adventure is the sense of the unknown. You should have a clear understanding of Your Goal and the Unspeakable Evil that guards it, but the gulf separating the two should be filled by a sea of question marks. What enemies will you fight? What lands will you walk? What trials will you face? What comes next? As an avatar for this adventure, Link is probably one of the best names in videogames. It’s short. It’s memorable. And it’s accurate. That little green-clothed fairy boy is the player’s direct link into the game, a vessel to the world that doesn’t know more about it than you do. So you’ll lead him around directionless and when monsters start jumping out from their foliage—you know that’s what those clouds represented—you’ll flail your sword trying to fend them off. Chances are you won’t get very far before you die and restart at that clearing. Maybe from there you’ll bravely cut a path in another direction. Maybe you’ll diligently go back down the one that defeated you. The essential component to an internal struggle is external difficulty- the quest has to push you to the brink of breaking. If it’s safe, it doesn’t take courage to see what’s around the next bend. If it’s easy, there would be no means to discover what you’re made of. Zelda provides the rarest of all experiences in gaming, ironic considering it’s the medium best suited to it: it gives you the real, complete experience of going on an epic adventure, testing the limits of your character, without the potential blood loss. The Lost Woods is a confusing maze that destroys your sense of direction. Its design is simple but effective, throwing off your means of exploring by randomizing the area depending on the sequence of maps you take through it to the point where exiting the side of one has Link entering it again on the other. Despite its simplicity, this area makes you truly feel like you’re hopelessly running around in circles, the disorientation amplified by the enemies chipping away at your life. The only way to escape is to puzzle out the right path. It’s possible that you felt dread, rather than freedom, at looking at all the options on that first screen. You are, after all, stranded in the heart of the woods. So the small map in the manual is a welcome inclusion, a cutout of the area with several key locations. Looking at it shows that aside from the sparse trees around you, Hyrule forest has lakes, mountains and a beach. This map is the entirety of the known wilderness at that moment, everything outside it uncharted territory. But the square is really a 6×5 grid of individual screens. This is important. The screens are the building blocks for all Zelda’s design. Since Hyrule consists of a patchwork of these indivisible plots of land, there’s an incredible amount of responsibility put on the layout of every one. But the work has a sizable payoff. Aside from the unified size guaranteeing a tight pacing that never keeps you from the next for more than a few seconds, the composition of identifiable units allows the player to chart the land intuitively. Because of them, you can express your routes as a sequence of movements comprised of north and south, east and west. The unique squares become navigable landmarks that reveal X leads to Y, left leads to Z. The map in your mind forms at the edges. All exploration is the process of moving from what is hidden to what is known, and the act will reveal a series of textured layers that form Hyrule; from the simple moblins patrolling the forest to the leavers that pop out of the sandy coastline, from the techtites that hop around the cliffs of Death Mountain to the Great fairies that reinvigorate the weary traveler – the land is alive with wonder. Explore and you’ll find a merchant selling items, including a blue candle that can be used to burn bushes housing their own treasures. Secrets beget secrets. As with the screens, the fact that every death on Hyrule’s overworld restarts you back at the first clearing is almost certainly due to the technical limitations of the NES, but they benefit exploring regardless. That anchor forces the player to familiarize themselves with the many possible routes and the creatures that inhabit it. Every detail will get etched into your memory. If you don’t have the map, it might not stop you from sitting down with your graph paper and making your own. It’ll tell you that if you head right one screen from the initial clearing then up four, there’s a twisted old tree across the bridge with an ominous face, its mangled grin just big enough to squeeze through. This tree is the first entrance to Hyrule’s past. There’s a stark contrast between the dungeons and the forest, providing a man-made civilization to compare against the natural world, and trading the open-ended freedom for a linear, controlled challenge. The design repurposes the single screens into a ruin built of rooms, each offering its own mini mystery requiring you to dodge traps, trigger switches, and loot keys before it can be conquered. It’s an ancient tomb to plumb with treasure to be found. And at the end, a great green beast protects the first piece of the shattered Triforce, the magical symbol left by the gods. Before he gives you the sword, the Old Man in the cave shouts “IT’S DANGEROUS TO GO ALONE! TAKE THIS.” Pressing ‘A’ right then and there causes two things to happen: Link’ll swing his sword and a glowing beam of energy will fly out the tip with a satisfying kchoh sound. You can shoot the laser sword forever, as long as you have full health. Great as it is, I’ve long been confused by these kinds of design decisions. Why would a game reward strong players by making it easier for them? The many distinctive enemy types are each capable of a wide range of behaviors separately, and create a diverse set of complex combat scenarios in the aggregate. Where later top-down entries would implement scrolling screens that allowed players to be choosier about framing their individual encounters, the single screen unit presents you with an entire battle scenario at once and expects you to deal with it before rewarding the right to safely explore. That there are a few rotating enemy spawn patterns for each and every direction you enter the screen, mostly succeeding to provide comfortable breathing room in which to have a moment to observe your situation, allows it to smartly maintain the games challenge and represents its inherent fairness. If that challenge proves too great and Link falls to one heart, a panic-inducing high-pitched, two beat rhythm will interrupt the exhilarating music and warn of the danger. Here’s the kicker: because the only other practical means of replenishing health besides visiting fairy fountains is by killing enemies for drops, what follows is an elegantly built, self-reinforcing combat system. First the game exposed the vulnerabilities in your form by beating you down, now it incentivizes you to stand back up and make adjustments. You act because survival demands it. That nerve-wracking beeping puts adrenaline in your blood and sharpens your mind. So pull back and reassess. Observe monster behavior, how they move and attack. Embrace your defensive capabilities and gain the courage to stare down the arrows flying at you and let them bounce harmlessly off your shield. Learn to stay calm under duress and dedicate all your cognitive faculties to the task directly before you. Feel out the lightning quick sword animation, and explore the flexible weapon combinations to suit your preferred playstyle. Soon, you’ll be moving accurately, guarding smartly and striking quickly. And when you succeed, it’ll be because you honed your skills. You’ll become confident in your own abilities. Additions to later Zelda’s would interrupt this feedback mechanism and de-emphasize skill building. Hyrule would be populated with vegetation to be cut and pots to be smashed, refilling Link’s inventory and getting him hearts if he’s in danger. Though this added personality to the setting and created a smaller exploration pull than had appeared in the series before, it also provided players with an ever present safety net for poor play and applies a firm brake to the forward momentum. 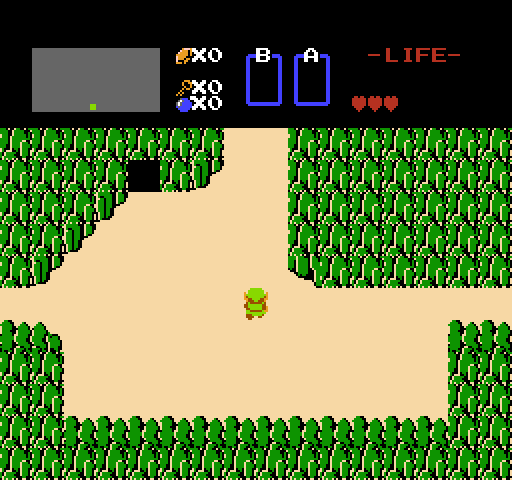 The first Zelda has tight combat and doesn’t turn the player into a scavenger that compulsively breaks stuff for loot. Back to the paradox of that laser sword: when you’re injured and weak, you work hard so you can get better; when you’re healthy and strong, you work hard so you can stay in peak fighting condition. The Legend of Zelda’s design creates levels of skill and implements mechanisms to elevate you to them while keeping you on your toes. It molds you into a warrior. By the end of the first dungeon, Link has stuffed his wallet with rupees, found a magic boomerang, and now stands before the giant dragon guarding the ruin’s final door. Link runs up and attacks his head, evading the three large balls of energy it spits from its maw. Because of the rhythm of the attack, Link is forced to retreat, regroup, and repeat. A handful of strikes later and it falls, leaving its holy treasure free for the plunder. There’s something quite powerful about retrieving the first piece of the Triforce. You have obtained something that does not exist in reality, has no practical value. Why then does taking it in your hands feel so profound? The answer is fundamentally emotional and spiritually vital, and only grows with every golden piece you add to your purse: through the two pillars of exploration and combat, The Legend of Zelda has rewarded your effort with pride. And you have many reasons to be proud. You progressed from aimlessly walking along beaches to navigating a haunted graveyard; from recklessly flailing your sword at bats to slaying two-headed monsters. You’ve charted the unknown and shed light on the mysterious. You improved, mentally and physically, in the quest to defeat an evil wizard and return a princess to her throne. The Legend of Zelda is remarkable for providing something of immense personal value within its small framework. Games, like literature, condense complex conceptual scenarios down to their essential components in order to exist in observable chunks of time. By distilling the conflicts that real life throws at you into a small experience, you can quickly absorb feedback that would otherwise be extended over weeks, months, or years, because of all the elements that affect the daily act of living a life. The best adventures are the ones that start you off investigating the world, only to find yourself. Staying focused on the task in front of you, remaining calm under pressure, and persevering through hardships, these are all productive skills that cultivate success, regardless of the area of life that you apply them. They raise your confidence so you’re prepared for the next great quest that comes your way. That fact is acknowledged in the sequel. The manual for Zelda 2 reveals that Link has the Triforce of courage embedded in his left hand. Through its masterful design, The Legend of Zelda tells the tale of how you earned it.